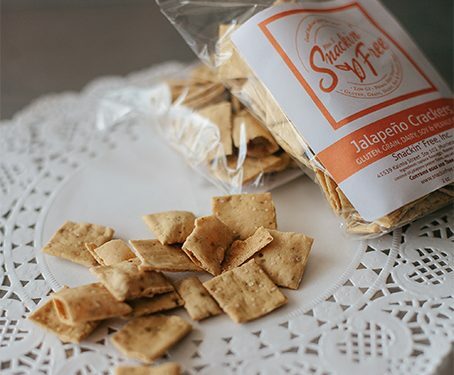 Whether you’re going on a business trip, a family vacation or just visiting grandma for the weekend, it pays to be prepared and more so if you have special dietary needs! Ever heard the saying “if you fail to plan you plan to fail”? Luckily today, we have the ability to Google anything to ensure we are properly prepared for almost every occasion. 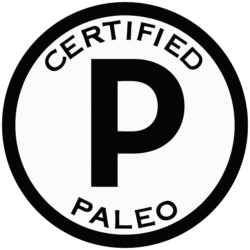 This includes meeting special dietary needs, such as Paleo, Auto-Immune Protocol (AIP), and peanut or other allergies, gluten free etc. Remember, during your trip you will have to stand in long lines, be asked to wait patiently, and probably experience delays along the way. 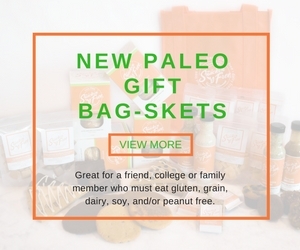 So let the paleo planning begin! Taking the time to research while still at home can save you minutes or hours of pain and agony while you’re traveling. There are several websites and apps that can assist you during your travels, like Find Me Gluten-Free, Yelp, and Google but you may not always have the best cell reception or Wi-Fi so best to do your research form the comfort of your desk, kitchen table, or couch. Look for a hotel close to the event venue shopping area that will have a grocery store, coffee shop and/or restaurants nearby and when you make a reservation, inform the hotel staff that you have special needs such as on a paleo, gluten free, dairy free etc.. Ask them if they can send you an email with the best restaurants that serve gluten, grain, dairy, soy, and peanut free foods. You can also ship your food items to your destination in advance. If you are staying in a hotel be sure to inform them if you will be shipping a perishable package in advance any give them specific directions for storing your package until you arrive. *Hotel Tip: If a fridge is not provided by the hotel you can call ahead and request that they place one in your room (they keep them on hand for just this reason). Also, if there is a medical condition which requires you to eat a special diet or If you have medication that needs to be refrigerated (be sure to carry a doctor’s note stating such) they are required to provide a fridge free of charge. Tip: The less you have to search on the go the better – you don’t want your hangry kids, spouse, or boss asking you where to go first thing in the morning because they need food or more importantly coffee. All this planning might seem like overkill now but plan every breakfast, lunch & dinner while traveling. You will be happy you did during your trip. Like we said before there are some amazing apps you can use on the go during vacation but you may not have time during your trip to search through multiple reviews and menus, so best to do that now. First things first, Breakfast, it is the most important meal of the day! Search for a breakfast location near your hotel and be sure to check their hours, especially if you are traveling for business and have to be at a conference early in the morning (you don’t want to show up to a closed sign). You might also go one step further and call to ask how they prepare their foods. 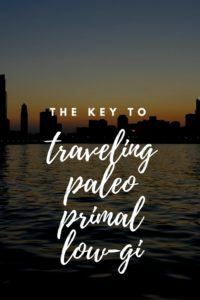 Next plan dinner, be sure to make a reservation so its set in stone and you don’t have to worry about a long wait if you are starving – because if you are really hungry those non-paleo foods you try to avoid become more appetizing and you may slip up. Start your search by looking for destinations near the hotel, event, or where ever your day will be taking you. Tip: If you are on a business trip or traveling with a large group volunteer to be the “restaurant finder person”. The last meal you need to plan is lunch. Look for restaurants near the event of where you will be during the day – a great quick option is an organic grocery store like Whole Foods, which most likely will have a great soup and/or salad bar with all the necessities. Our first tip for is BYOF (Bring your own food). We recommend at least bringing your own snacks and food for the flight, potential delays, and the return flight. 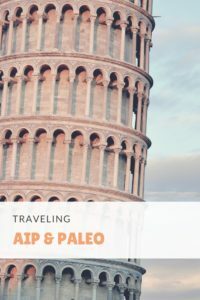 Often flights only offer pretzels, chips, or treats that are not paleo friendly. Don’t take any changes, especially if you have been diagnosed with an Auto-Immune Deficiency. There are Several national restaurant chains at most airports that offer gluten-free menus to steer customers towards safer options. If you’re interested in a quick meal, consider the newsstands, they offer box lunches, salads and fruits! Take the time review their offerings since they too now offer gluten free options. Gate Guru is a great app that provides detailed airport information including restaurants locations in airports. It always pays to be cautious, especially when it comes to foods! Consider bringing a small container of dressing as an example, but make sure that it doesn’t exceed the maximum fluid ounces, so check with the Transportation Security Administration (TSA) Liquids Rule. Also, consider getting a medical letter for travel that identifies your special needs. This can assist greatly when going through the security checks, although you still must abide by the TSA rules. For the flight, call the airlines and ask what options they have for individuals with special dietary needs. You can also ask them to make a special announcement regarding allergies, so other travelers do not consume the items that effect you. Check to see if they will accept a doctor’s note so that you can bring your own food and possibly store it in the refrigerator. Airlines generally charge $25.00 to check a bag, so consider mailing what you need to the hotel in advance. United States Postal Service (USPS) offers flat rate shipping boxes, the price ranges from $6.80 for a small flat rate box to $18.75 for a large flat rate box. This is a great option to avoid the tricky TSA liquid rules for necessities like toothpaste, shampoo, conditioner, etc. You can also use the USPS Flat Rate box to ship your specialty foods to your hotel. You can contact the front desk and request they keep it refrigerated. In most cases, you will arrive within hours after your package. 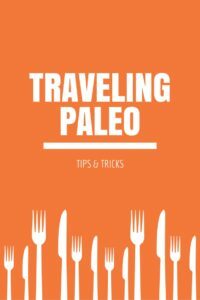 Now that you have planned out meals, snacks, and all other travel arrangements it’s time to put all the information into one document. *Make sure you include business name, address, phone number, and hours. You don’t want to have a flight delay and show up to a grocery store that is closed. For dinner include the reservation name and number in the party. Now you are all packed and have your itinerary ready, so all you have to do is enjoy your trip.